Bidibot, the world’s premier penny auction site for gamblers, has done a deal with online gaming giant 888.com to offer auctions for 888.com poker credits. Players are welcome to come and bid on $50-$200 credit packages on 888 Poker. The credit packages provider their winner’s with unfettered credit at 888 Poker, and not with the bonus money and associated play-through requirements typically offered at other online sites. 888.com joins PokerStars, VictoryPoker, GCasino, Betfair and many other top gaming brands on the Bidibot Platform. Players from any of these sites are invited to win credits and tournament entries at their favorite sites. They are also invited to join any of these great sites via Bidibot following their successful bidding on packages from any participating Bidibot partner site. “The savings our players get on their bids typically exceeds their expectations and they are getting chips at the sites they already love at a fraction of its face value. There is no casino or poker room bonus that can touch that value” according to Bidibot Founder John Tabatabai. 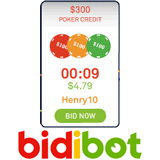 Bidibot not only gives its players value, but offers the fun and entertainment of the penny auction process. “Even if you don’t normally look for added value, Bidibot is still great fun as an auction. New players get $10 in free bids just for registering, that’s how confident we are in our product!” continued Tabatabai.